Fabric paint is expensive, and I didn’t want to buy a lot of large bottles of different colours (which I might only use once) so I researched what other options there were. I found that acrylic paint is water-resistant after it dried completely (but only then! ), even when used on clothing. Of course it also hardens when it dries out, but that’s where the glycerol comes in. Glycerol can be used as a plasticizer, but won’t effect the water-proofing of the paint (which again, will only take in to effect if its dried completely). Glycerin is easily found in drug stores and is a mix of 80% glycerol and 20% water. I mixed 20% glycerol with 80% water, and mixed this with the acrylic paint till it was watery enough to be easily poured out of the mixing cups. I bought a “fit and flare” black dress, but unfortunately it was made of 100% polyester and didn’t lighten when bleached (not at all). Luckily I bought a second dress, made of (97%) cotton, as a backup, which did work! I started out by tailoring it, as I need to tailor most of my clothes (broad shoulders and hips from sports, but small waist = impossible to find clothing of the racks). Then, I washed it, but didn’t dry it. 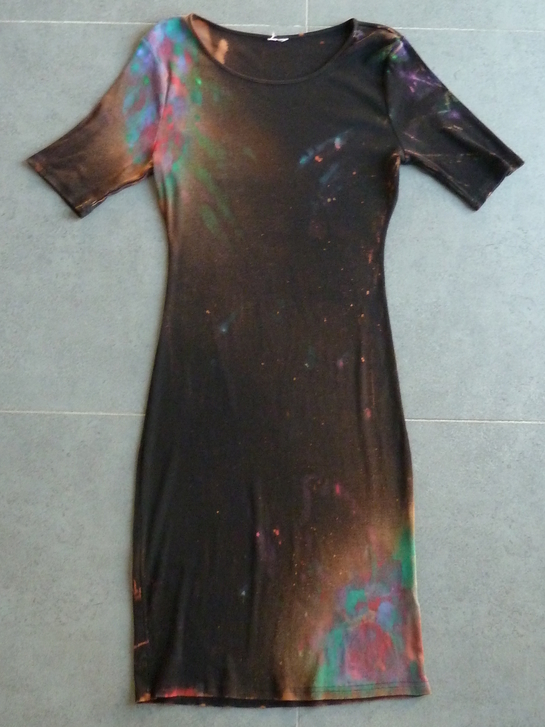 I laid down the dress in our shower, put some bleach in an empty hair-softener spray bottle, and sprayed the front of the dress. First I made the two large area’s on my shoulder and thigh area. I sprayed the section in between them from further away, with some diluted bleach. As a finishing touch I put some pure bleach on an old toothbrush and ran trough the bristles with my fingers so it would splatter all around. (The effect of the bleach didn’t show right away, so I successfully practiced my patience instead of rigorously spraying on more and more *super proud of myself*). Because it didn’t bleed through that much, I turned the dress around after 15 minutes and repeated the process on the backside. Again after 15 minutes, I rinsed the dress with generous amounts of water, so to avoid lightening of other areas from leftover bleach, after which I put it in the washer to wash it properly (with detergent) on a short cycle. For the painting part, I prepared my shower by laying out a bin liner on the floor. 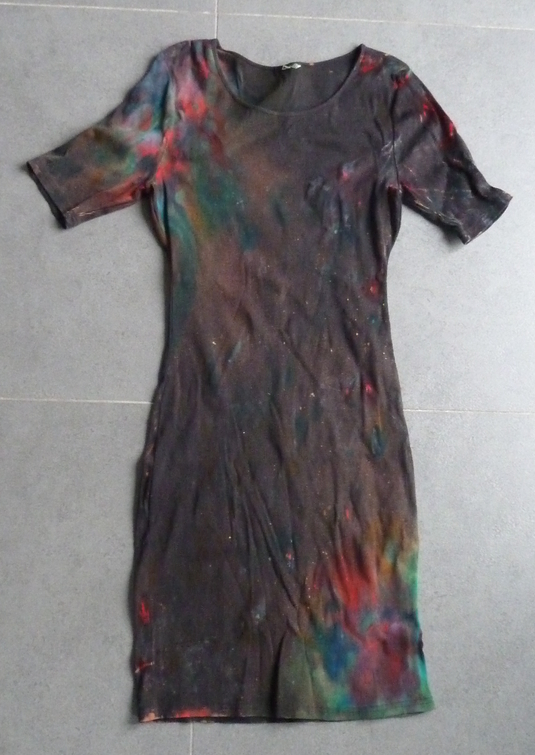 Once the dress was washed, I laid down the wet dress on the bin liner. 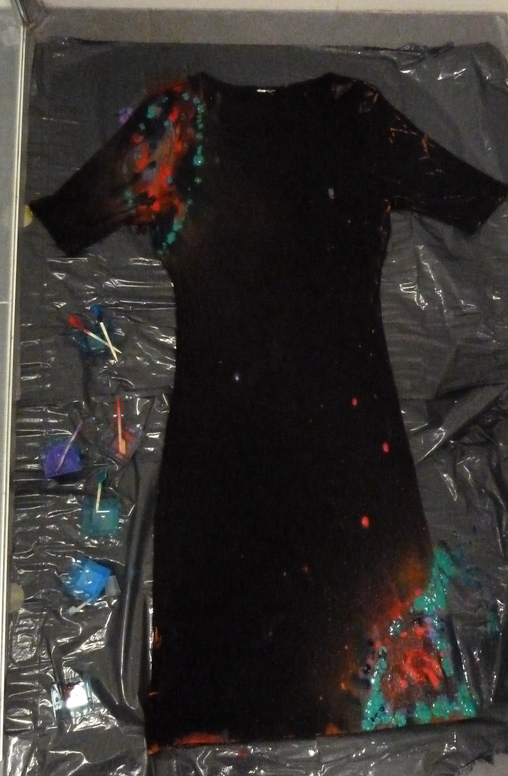 I had already prepared my paint-glycerin solutions, and I dripped and smudged the paint in a “nebula” kind of way. 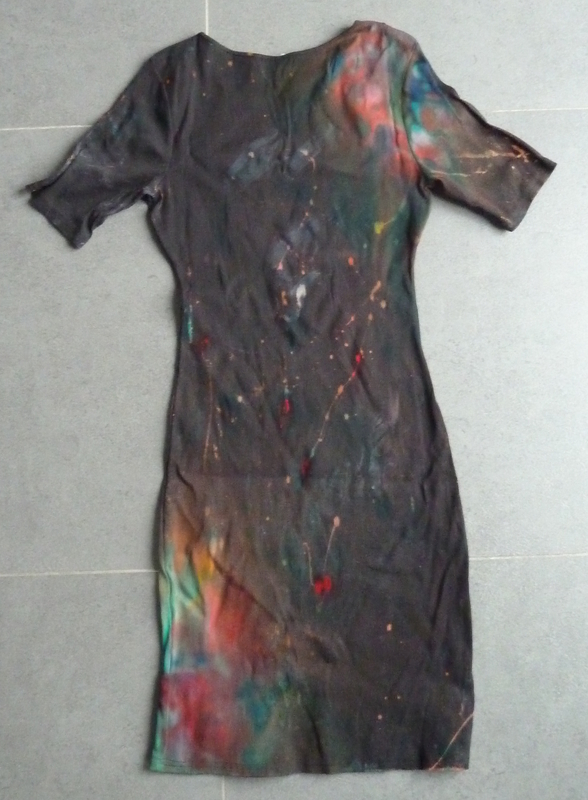 Because the dress is still wet and the paint is mixed with water, the cloth fibres draw the paint into them and it does bleed through to the back properly. 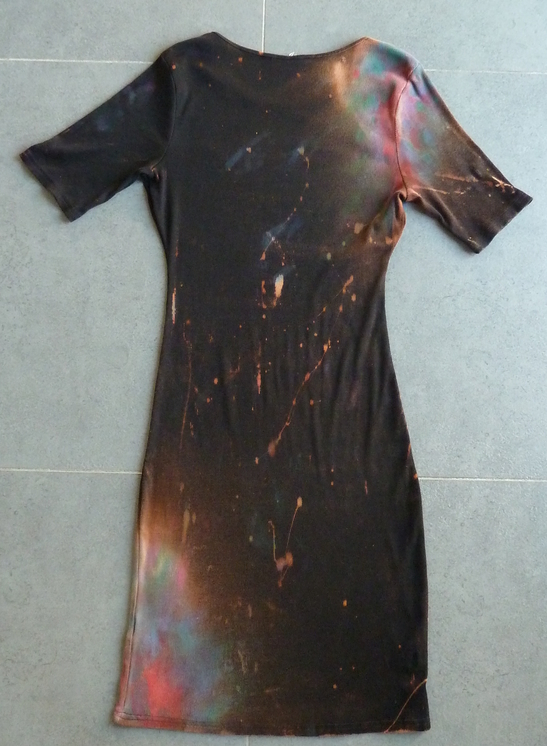 I may have sprayed some extra water onto the dress so the colours would blend properly. 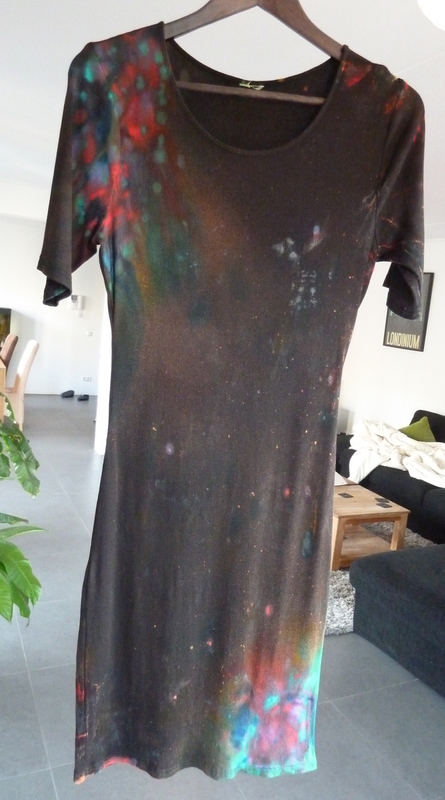 After painting, my patience was once again tested, because now the dress had to dry completely. This took more than a day. (Here, the paint is still wet and the blue is quite bright. Acrylic paint will darken in colour when it dries). 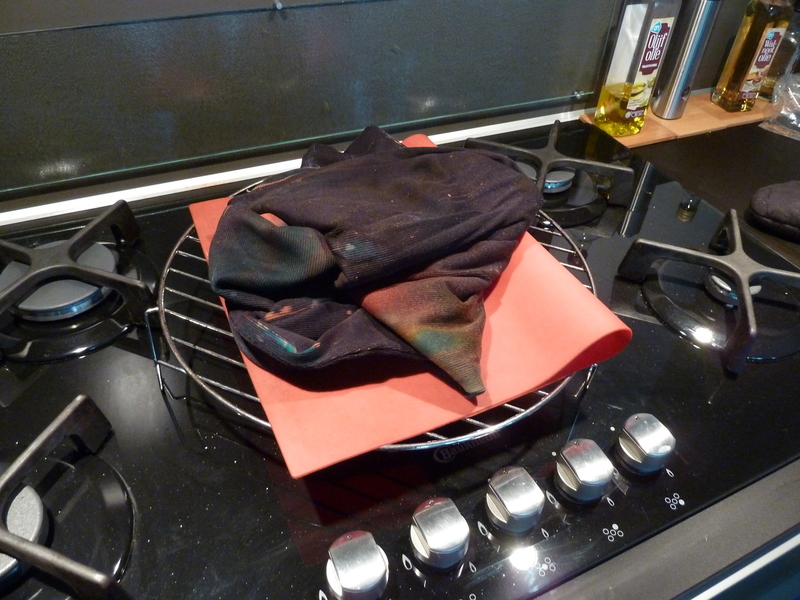 After the dress was dry, I read that I needed to ‘secure’ the paint with heat. One of the ways to do that is to ‘bake’ the clothing in a 175 deg C oven. I ‘baked’ the dress for 15 minutes, whilst I stared at the oven just to be sure nothing would spontaneously burst into flames. 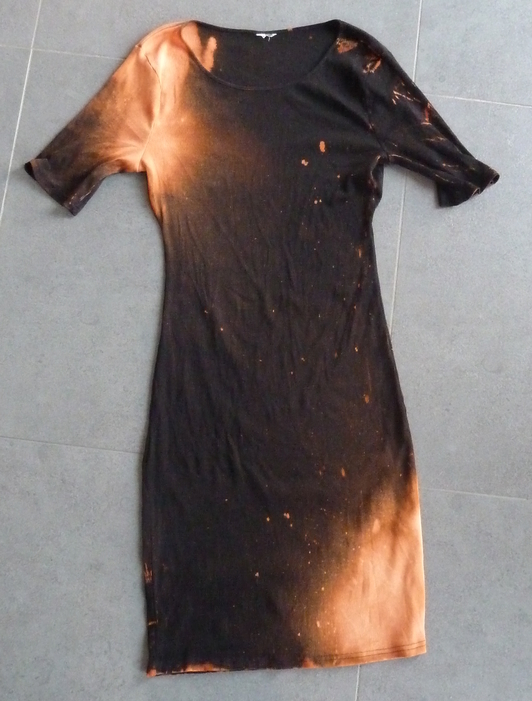 (I checked, the lowest burning point of paint, cotton and other additives would be above 200 deg C, but I wanted to be super sure I wouldn’t burn my house down). 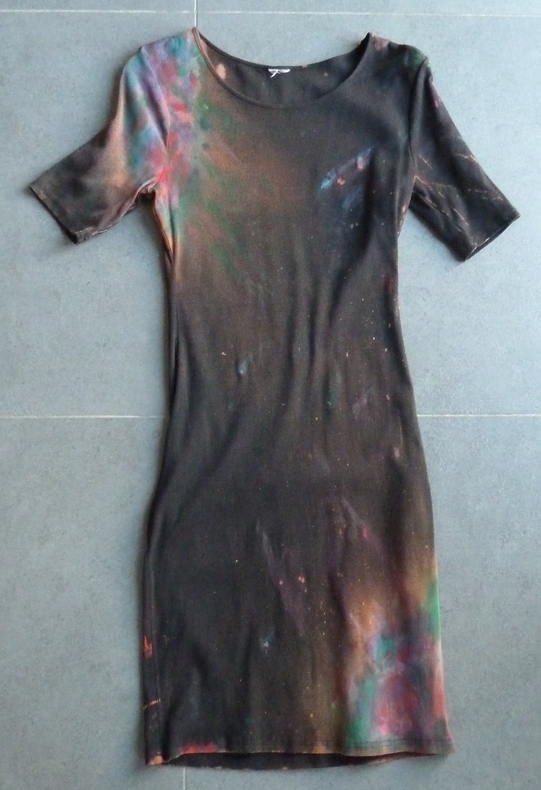 After ‘baking’ the dress looked the same as before. After washing however, lots of colour had vanished. So, hoping I did something wrong, or more colour would magically work better, I tried the whole painting-part a second time. This time I made sure to use of a lot of (glycerine-watered down) paint and to let it dry extra long. 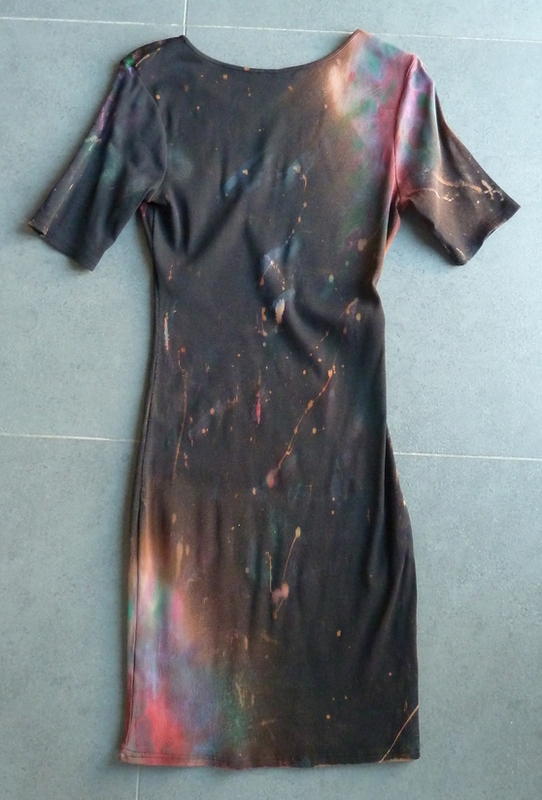 Because I fell ill during this time, I ignored the project for two days before washing the dress again. After washing it a second time, the colours looked a bit deeper. Thats it, it’s done! In daylight it looks like a part of space. 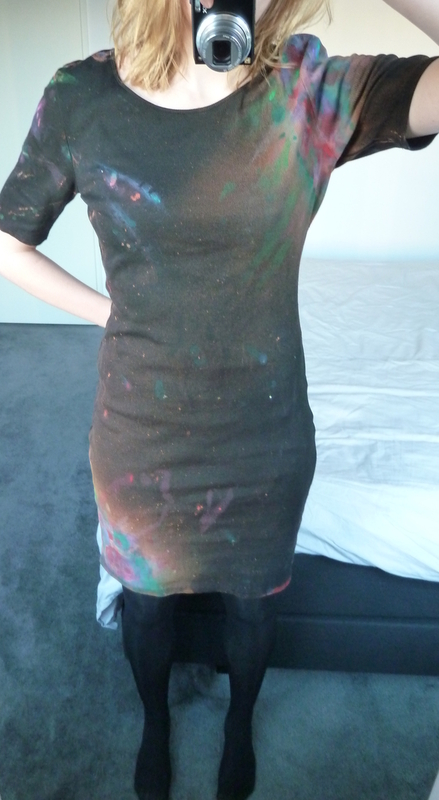 And of course I wear it with my twinkling LED-dress underneath. This entry was posted in Arts & crafts, Tech by Jildsma. Bookmark the permalink.